Make Way : Regan Gentry. Motorway over-bridge made from cane, baskets and twine. 1:3 scale. Eight week duration. 12.5 x 3.5 x 4.2m. 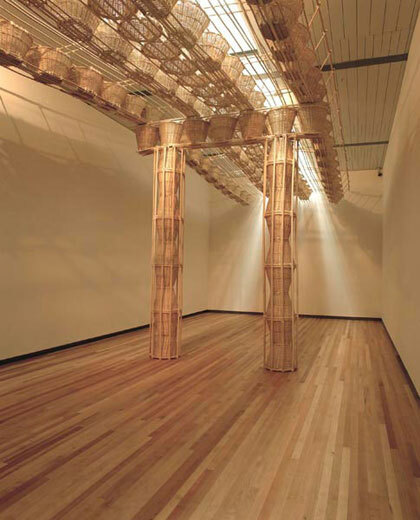 Hirschfeld Gallery, City Gallery Wellington. Curated by Abby Cunnane. Whenever my father saw a promising space he thought of ways in which it could be crossed, and yet for all that he loved spaces (Margaret Mahy, The Bridge Builder). Cities should be designed for people, insists sculptor Regan Gentry. Public space and public life should be at the heart of urban planning, and of the city itself. His arching motorway bypass bisects the gallery without announcement or apology. Its title, ‘Make Way’, is both command and absurdity, as this lofty so-called bypass in fact goes nowhere. 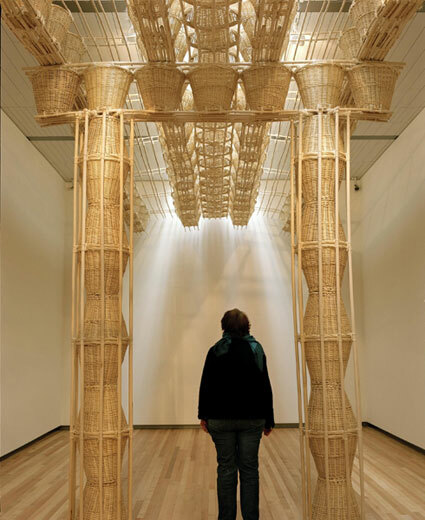 Constructed entirely from cane basketwork and twine, the structure is an anachronism or fantasy in other ways too, relic from an era of handmade craft or model making. Its idiosyncratic architecture and location in the gallery is a challenge to the conventional wisdom of urban planning, a gesture recognising the place of humans within the ever-increasing sprawl of city landscapes. The artist’s experience as a pedestrian and cyclist in the city led him to think about the influence of urban planning and roading systems on everyday living. It is projected that by 2025 half the world’s population will live in cities (Richard Rogers, Cities for a Small Planet 1997), and urban infrastructure races to keep pace with this frightening expansion. We are increasingly reliant on cars and roads to negotiate urban sprawl, and yet they are a direct cause of pollution, alienation and social division. Make Way points to this inconsistency, suggesting the need for a model of urban planning which is responsive to both people and the environment. In his book The Architecture of Happiness, Alain de Botton writes, ‘to take architecture seriously is to accept that we are, for better or worse, different people in different places…architecture’s task to render vivid to us who we might ideally be' (Alain de Botton, The Architecture of Happiness, 2006). 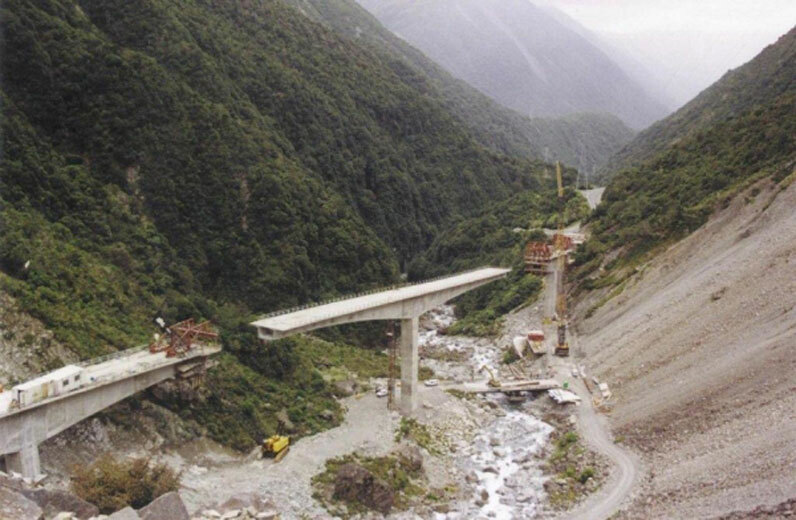 Bridges and road structures are often associated with Herculean human accomplishment, the triumph against natural forces and the limitations of materials. 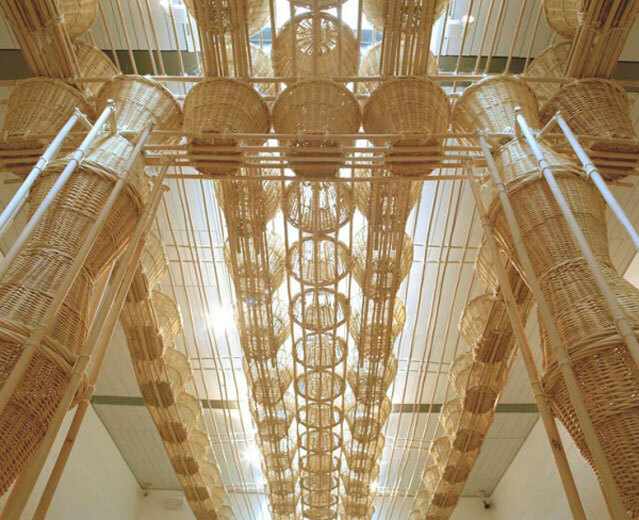 In this work an emblem of human prowess and heroic architecture is transformed into an expression of imaginative possibility; a handmade-looking structure hints at a different way of thinking about getting from A to B, of negotiating shared space, and of sharing fantasy. (Margaret Mahy, The Bridge Builder).